Making a special pre-Christmas journey direct from the North Pole, Father Christmas (Santa) is inviting kids and their families to a breakfast exclusively at the YPCC! Come join Father Christmas and the Ebensburg Woman’s Club in celebrating the holidays. To help pay for the extra hay required by Santa’s reindeer to make this special trip, admission will be $5.00 per child ages 3-10, $10.00 per adult and per child 11 and over, and children under 3 are free. Enjoy a full breakfast – Create a holiday craft – and Listen to a Christmas story! Pre-registration is recommended but not required, walk-ins always welcome! Pre-register here. For questions or to register, call 814-208-5786 or email EWCBreakfastwithSanta@yahoo.com. Visit our holiday craft fair at THREE locations as you begin your Christmas shopping. Over 100 costumed vendors on hand to peddle their wares and serve their fare. Exhibitors will display a wide variety of hand-crafted items such as clothing, home decor, baked goods, spices, wood crafts, metal sculptures, art decor, and numerous other unique products. Our craft shows focus on hand-made original crafts and products, and will grow to be the region’s largest craft show! This event is just what Santa ordered; an enjoyable, affordable place to unwind with friends and family. The craft fair at Holy Name Church boasts 50 vendors and is open from 8:00 a.m. to 3:00 p.m. There is also a bake sale and food booth. The craft fair at Dauntless Fire Station, and right across the street at the VFW, are open from 8:00 a.m. to 4:00 p.m.
Stop by and check out our selection of crafts, crystals, jewelry, specialty drinks and boutique clothing! Vendors will include Ellie’s Bittie Bows, Robin’s Creations, All About That Bling, Basic Bittie Boutique, Kimber Cal Boutique and Rhinestone Diva! The streets of historic Downtown Ebensburg will come alive with the Christmas spirit. Wander into a local restaurant or pub offering Dickens-era food and ale; shop for antiques and collectibles; enjoy checking out the Victorian Costumes! In “Victorian Ebensburg”, don’t be surprised if you run into Father Christmas! You will have the pleasure of walking tree-lined streets outlined by Victorian lampposts, resting on a Victorian park bench and simply enjoying an old-fashioned holiday. It’s a day right out of “Currier & Ives” in Downtown Ebensburg! Enjoy the cressets in Penn Eben Park, filled with wood and set aflame. A “cresset” is a basket of fire. They were kept continuously alight and placed at the focal point of a community. Around it people gathered for their meetings and social discourse. From it they took fire to light and heat their own homes. Ebensburg’s cressets are hand-made based on 18th century originals. An outstanding display of carved ice sculptures will be located in Penn Eben Park. Come and watch the talented ice carving team sculpt 23 seasonal images! During Dickens of a Christmas, ice is just the tip of the iceberg. Snow, ice and Christmas often go together. The reason that we think of Snow and Ice at Christmas is attributed to the Victorians! It was the Victorians who gave us our “traditional” Christmas in Europe and the United States. At the start of the Victorian era (1837), Britain was in a mini ice age that was from about 1550 to 1850. During this time, in London, a winter fair was held on the frozen River Thames. When Charles Dickens was a child, Britain had very heavy snowfalls around Christmas, so when he wrote A Christmas Carol he put lots of snow and ice in it! He also put snow at Christmas in some of his other books like The Pickwick Papers. Charles Dickens’ books were very popular (and still are!) so when the Victorians read the books, they thought of snow and Christmas together! The Ebensburg Rotary Club will be giving out FREE hot chocolate in Penn Eben Park. Stop by on your way to see Santa Claus! The First United Church of Christ Sunday school program will be having a vendor and craft show in the education Hall from 8 a.m. until 3 p.m. Food, snacks, and drinks will be for sale with all proceeds benefiting the Sunday School program and activities. Santa Claus will also be stopping by after his visit to Penn Eben Park and will be available for pictures with your children until 3 pm! Bring your camera and take your own free picture as a special keepsake! “Some Useful Christmas Carols You Might Not Know” This will be the theme of the Allen Organ Workshop, led by Organist Richard Merryman. At noon, a time of food and fellowship will follow the organ workshop where participants will have the opportunity to share ideas and suggestions from the workshop leader. Mr. Merryman will conduct this three hour, pre-Christmas workshop from the Ebensburg Presbyterian Sanctuary, which now houses a new state of the art, three manual Allen Organ. To begin with, Merryman will offer a brief background about the five basic stops of the organ, along with their appropriate use in worship. Next, Merryman will provide copies and commentary about unusual Christmas carols, useful as rousing congregational songs or easy choir anthems, or creative organ solos, complete with stop suggestions. Finally, Merryman will share a philosophy about church music, intended to aid organists, choir directors, and pastors in fostering enthusiasm and enjoyment for church music in these troubling times of transition. Visit the First United Church of Christ on East High Street and view a model railroad display. Model railroading has become an integral part of Christmas in America. Ironically, it is undeniable how much Dickens abhorred the rail system and the impending industrial revolution that was to sweep England (and the world) in the mid-nineteenth century. Dickens writes of railways as though they were the epitome of gloom and doom, catastrophic, as demonstrated in Dombey and Son. Charles Dickens seems to be mourning the death of a different life, one he will never return to. Dickens was using the railway and the death of a particular lifestyle as a metaphor for the death of young Paul Dombey. Charles Dickens is mentioned in most books that were written on the history of the British Rail system, which is indicative of the fact that Dickens’ critique of the railways and the industrial revolution must have reached far beyond the pages of Dombey and Son. The Ebensburg Christmas Parade is a grand tradition! The theme for this year’s parade and other events is “Classic Christmas Movies”. The parade begins at the middle school, proceeds down North Center Street, turns right onto West High Street and finally north on Julian Street. The center of town is your best seat! The parade will include holiday floats, local civic organizations and churches, fire equipment, dancers, marching bands, and more. As always, a very special guest from the North Pole will signal the end of the parade and the beginning of the holiday season! Residents and visitors are encouraged to dress in Dickens-style costume for the parade and their afternoon in Downtown Ebensburg! An entry form can be found here. As soon as his duties with the Christmas Parade are discharged, Santa Claus will visit the gazebo in Penn Eben Park. There he will distribute free Christmas treats to all good little urchins, compliments of the Central Cambria Lions Club! Mom & Dad are free to take photos of the kids with Santa, or the Dickens staff will take a photo for you and email it to you later. Photos are free, compliments of Claire Terese Photography! In this busy holiday season, take some time to pause and remember the story of Jesus’ birth by stopping by our Live Nativity Journey. Let the Story speak for itself as members of the church portray this ancient story in simplicity and beauty as it continues to bring hope and light into our dark world. Don’t let the rush of Christmas push out the true reason for our celebration. After your journey, please join us in our Fellowship Hall for light refreshments and tour our church family’s Nativity Festival displays. A sight for all to see and enjoy this wonderful season. Experience an old-fashioned horse-drawn sleigh ride or carriage ride through charming Ebensburg. Your ride will take you over the meadow, through the woods to grandmother’s house. Let our holiday sleigh take you back to yesteryear and become a part of your family tradition. You and your whole family will enjoy this nostalgic ride. Warm up with hot chocolate, spiced cider and coffee upon your return. Carriage & sleigh rides are only five crown ($5.00) per person. Mrs. Buck is back and serving a holiday luncheon. Reservations are a must. Limited seating. Donation – $20.00. Museum will be closed to the public during luncheon. Contact the Cambria County Historical Society at 814-472-6674 or by email at: awbuck@verizon.net. The Christmas music performance at the First United Church is a Dickens highlight each and every year. Visit this old Historic Welsh Independent Church established in 1797 – the first church in Cambria County. Experience the past in style as you celebrate our “Dickens of a Christmas” concert featuring your favorite Christmas songs. Betsy Pike’s students will perform a string recital at 12:00 p.m., followed by the Bell Choir, Chancel Choir and La Bella Musica performing favorite Christmas music at 2:00 p.m. Come early – the kids won’t want to miss the model train display in the church basement open from 10 a.m. to 4 p.m..
Saturday; 1 p.m. to 4 p.m. & 6 p.m. to 9 p.m.
County employees do a terrific job of decorating the courthouse row offices for the holiday season. The courthouse is open to visitors Saturday during scheduled times and is a stop that the entire family will enjoy. 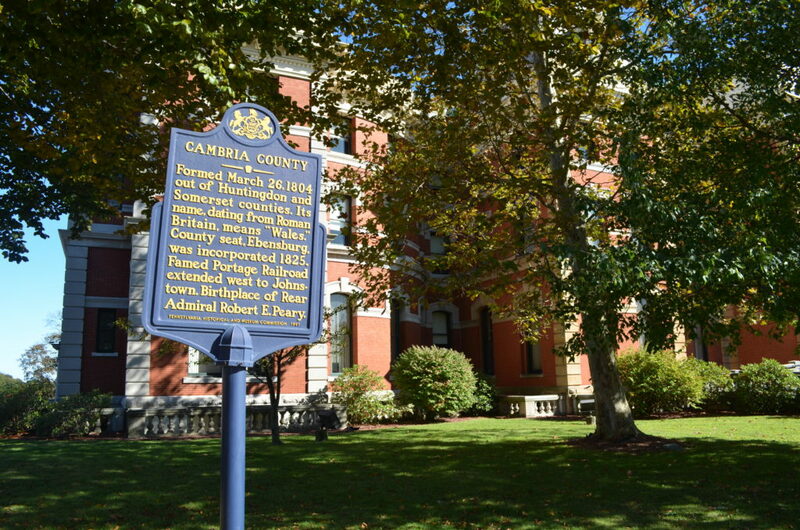 The Cambria County Courthouse was originally constructed in 1880, a decade after Dickens’ death. Major additions were made to the building in the early 20th century. it stands today in its original splendor as an example of Victorian Second Empire architecture. Join us for our annual open house in the holly-decked halls of the A.W. Buck House, home of the Cambria County Historical Society. Refreshments, tours and more. Our Christmas tree in the library is always a holiday delight. The A.W. Buck House was built in 1890 (only 20 years after Dickens’ death) in the Victorian Queen Anne Style. The house belonged to a well-known local banker, and more recently served as a convent until the Society acquired it in 1991. There is no charge for this event. The Ebensburg Presbyterian Church will be hosting the annual Pipe Organ Christmas starting at 3:30 p.m. on December 1st. Recitalists will include Melissa Douglas, Tom Nagy, Becky Klezek, Kevin McKenrick, Sarah Kirsch, Ann Chicchi and other local area musicians. The recital will feature various arrangements of favorite Christmas hymns and a sing-along with traditional carols. The 2018 recital will also feature the addition of the Ebensburg Presbyterian Church handbell choir and a brass quintet. The recital is free to the public, but donations towards the restoration fund of the historic organ are appreciated. About our organ: The M.P. MÖller pipe organ at Ebensburg Presbyterian Church has serviced the congregation since 1915. The placement of the organ above the floor followed the advice of Dr. Albert Schweitzer, the famous missionary physician, theologian and organ scholar. Mechanisms were switched to electric in 1947 and the trumpet stop was added in 1976. The church has recently begun a fundraising campaign to restore the organ based on the guidelines of the Organ Historical Society (OHS). The new console was installed in August 2018 and will be dedicated during the December 1st recital in Memory of Fremont McKenrick, who served as organist for several decades. Saturday, 6:30 p.m. & Sunday, 4:30 p.m.